Tiwaz, Elder Futhark Rune of Norse God Tyr, Sacrifice and Law. Last month I pulled the rune Dagaz, a rune all about breakthroughs and new beginnings. This coincided with a major life change for me and certainly reinforced my confidence in the runes and my journey with them. The next rune I pulled was Tiwaz, the rune of the god Tyr. Tyr is a god of war, but also of law and justice. Tyr was invoked when victory was needed in battle. He gives the day ‘Tuesday’ its name, and has been conflated with the Roman god Mars. Tyr’s primary myth is the story of the Binding of Fenrir, the great wolf who inspired fear, even in the Gods. Fenrir did not trust the Norse Gods, so when they wanted to place fetters upon him, he wanted a guarantee he would be released again. He asked one of the gods to place their arm within his jaws. Only Tyr would do this, knowing full well Fenrir would bite once they refused to release him. Sure enough, the fetters securely bound the wolf, and Fenrir bit down as promised, severing Tyr’s arm from his body. This willing sacrifice for the greater good is a key aspect of Tiwaz. Giving up something which is important to us for the benefit of others is noble, but often extremely difficult to do. We don’t need to lose an arm, like Tyr; Tiwaz can indicate that we need to give up our time, by volunteering, perhaps, or spending more time with the kids. Tiwaz could also mean we need to give up something physical. Maybe you’re in financial difficulties, and selling your beloved collection of [insert favourite obsession here] could give you the money you need to see you through to the next pay-cheque. Tiwaz can also mean sacrificing something we feel is important about ourselves. Maybe you see yourself as entirely self-reliant but are struggling on your own with a particular situation. It’s hard to ask for help when your ego demands that you stand on your own two feet. Tiwaz dares you to put the arm of your ego in the jaws of the wolf, and not to flinch as it bites down. You will not be harmed by the change in your perception of yourself. You might feel too proud to ask for help, but in this situation, you would learn to have pride in your friends and family and eventually in yourself for being willing to change and adapt. In my situation, just having become freelance and working to build a new schedule and routine, it’s not immediately evident what Tiwaz represents for me. I have sacrificed my day job in order to support my family better, but that was a sacrifice I was happy to make- delighted, in fact! What I have struggled with since the change is being my own boss. I’ve been so used to having someone else dictate my schedule, doing it for myself is tricky and slightly alien to me. Maybe Tiwaz is telling me I need to sacrifice my self-image as a routine-hating rebel. I’ve always seen myself this way; not chained or fettered to the clock, except when I have to be, due to the demands of others. Well, now those demands need to come from within. There’s no boss breathing down my neck, only clients and my own sense of drive and ambition. Tiwaz also represents the reign of law and order over chaos, and I hope that this aspect of the rune is telling me that peace will soon descend. Chaos has started to blur the edges of my life lately, with some deep loss and grief, and severe mental health difficulties. Perhaps, by remaining confident in my decisions and having faith in my own abilities, order will resume some claim over events, and life will start to settle back into the routine I so desperately don’t want, but clearly need. Tiwaz is a complex rune, and I have no doubt I will find it again in a future reading. For now, I feel like the rune is telling me not to grip so strongly to ideas of self-image, and be willing to change myself for my own benefit, the benefit of others, and for some peace and calm within my life. Don’t forget, you can tweet me @Mabherick if you want me to focus on a particular rune for this column. Until next time! Isa means ‘ice’ and is associated with stillness, stagnation and immobility. It is the third rune in the second aett of the Elder Futhark, also known as Hagal’s aett. Today I was pondering a frustrating work problem and decided to see what the runes had to say. My situation was that I wanted to make a change, but there was the possibility of a certain opportunity if I stayed where I was for the time being. It’s that age-old question immortalised by The Clash: should I stay, or should I go? I drew the rune Isa, which literally means ‘Ice’. Isa is associated with stillness and stasis. Ice seems to render flowing and fluid water suddenly still and motionless. It stops things in their tracks, yet it is beautiful and alluring. This makes it all the more dangerous, as while we pause, transfixed by cold beauty, we are not moving forward and completing our journey. Of course, sometimes a moment of stillness can be refreshing and rejuvenating. But when we stay still for too long, we become stiff, useless, and even forget why we were moving forward in the first place. This rune indicates that I am stuck. The work situation that I was worried about shows no signs of resolving itself anytime soon, and I am left with the same dilemma; to forcefully break out of the situation or allow things to take their course, no matter how slow and frustrating this may be. Although the frustration of being stuck is my primary reaction to Isa, Isa can mean so much more than this. Just as the earth rests in winter before new growth in spring, so do we sometimes need to let ourselves rest and be still before our lives get back on track. Isa can indicate a period of gestation; a time to let things grow and progress naturally. It could actually be the worst time to change or force change, as now is the time for rest and letting things take their course. Isa represents Niflheim, the cold and misty world of the dead. It is a place we fear to be; frozen and unmoving, with no chance of life. This is like real-world stagnation. We yearn to be ever moving forward, achieving and progressing. Isa makes us realise that sometimes, events which are outside our control can prevent us from moving forward, and that we have to accept that and not let that stagnation prevent us from being the best we can be. Continue to live our lives, as well as we can, and trust that when the ice thaws, the water will flow again. Our river will move inexorably towards the sea. The rune seems to tell me I just need to wait, for now. However, I should keep working at my problem, checking in, being cautious and aware of new information and changes. I should not let my ego take over but remain calm and avoid giving in to frustration. If I follow my own process and stay true to myself, eventually the ice will thaw, the problem will become clearer and the solution may even become visible. As an afterthought, I drew another rune, which was Dagaz, the rune of breakthroughs. This gave me more hope, and I’ll discuss this further in next month’s article. Don’t forget, you can tweet me @Mabherick if you want me to focus on a particular rune for this column. Until next time! Reading runes is a form of divination. All forms of divination require an open mind ready to receive messages and interpret symbols. A stressed and worried mindset will lead to false interpretations, or prevent messages coming through at all. Even the strongest connection between diviner and tools can be blocked by a worried mind or troubled soul. Of course, we often look for answers from the runes because we are troubled and worried. So how can we stop these worries affecting our divination? As an anxious person, believe me, I know this is easier said than done. Relaxation becomes even trickier when you have lots of questions on your mind. However there are several techniques you can use to relax your body, which will normally also help relax your mind. Listening to music is an old standard for me. Very familiar songs allow me to blank out everything else in my mind, and I often find that belting out a good tune can release a lot of pent-up tension. Classical music can also be very relaxing, but if you’re someone who finds classical music boring, don’t go down this route! Spend some time figuring out which music relaxes you. Are you more relaxed after shouting along to something upbeat? Or by closing your eyes and letting some panpipes wash over you? Services like Spotify are great as they allow you to search for relaxation music and sounds, if you can’t think of anything from your own collection. The pendulum method, or progressive muscular relaxation (PMR) is also a method I use to help me relax. It also works for sleeplessness. It consists of deliberately tensing groups of muscles, then allowing them to relax. The idea is that for the pendulum to swing the most one way, you first have to pull it all the way in the other direction. So muscles will relax better, or feel more relaxed, after being tense. You may start with your hands, work up to the shoulders, then down to the feet, all the way back up the body leaving neck and face until last. I tend to start with the feet and really take my time. I will talk to myself mentally as I do this: “I’m tensing my toes; I’m relaxing my toes. I’m tensing my feet; I’m relaxing my feet,” and so forth. The combination of muscular relaxation with focusing on the task will leave body and mind loose and ready for anything. Rune meditation is a specific type of meditation designed for understanding the runes better. However, any form of meditation before divination can help make the mind more receptive to messages and more skilled at interpretation. Meditation helps move our mind onto a different level of operating, and allows us to let go of thoughts and feelings which may be bothering us unduly. Breathing is the key to meditation. A very skilled meditation master advised me that breath is the only tool we ever need. Philosophical, but also accurate. Find yourself a comfortable position. There’s no rule that says you have to sit cross legged, or sit at all. Laying down is perfectly acceptable, although there is the risk of falling asleep! I have joint issues which means it’s very painful for me to sit cross-legged, so I normally sit on a chair or on my sofa, supported by cushions in order to have a straight back whilst remaining relaxed. Once you are comfortable, start to focus on your breath. Breathe naturally, but make a note of it flowing in and out of your body. Notice the breath coming in, then feel it leaving you. In, then out. Imagine yourself breathing in fresh, cooling air, and imagine any stress or tension leaving you with every out breath. Inhale refreshment, exhale stress and worry. Inhale light, expel confusion. Inhale relaxation, exhale aggravation. If you struggle to breathe normally whilst focusing on your breath, try counting as you breathe. Breathe in through your nose for a slow count of four, then breathe out for a slow count of five. There are lots of different breathing techniques to allow you to enter a meditative state. Once you find your mind starting to relax, you can start to let go of troublesome thoughts. Notice them appear, then just let them drift away. Don’t try to quiet your mind; this is impossible and can make you feel more stressed when you fail. Let the thoughts rumble through your mind but treat them as though you are watching traffic, or the birds flying by. You don’t need to be involved with them right now. Observe them, then let them pass. Stay in this state for as long as is comfortable or until you feel relaxed and comfortable. Always come back to yourself slowly, and gently. Drink some water. Thank yourself for the gift of relaxation. Now you are ready to read your runes. The Road to Runes: What Questions to Ask? One of the hardest parts of divination is asking the right questions. A question that’s too closed may get an answer that makes no sense if you’re expecting a definitive “yes” or “no”. Most runes have plenty of meanings, and aren’t always obviously negative or positive. Conversely, questions that are too vague or broad leave the answer widely open to interpretation. This can lead you to find an answer that you were hoping for, rather than an accurate one. I covered these “false positives” in last month’s article. So what are the best questions to ask? What questions lead to the best answers? Experimentation has led me to narrow it down to a few I come back to again and again. Let’s have a look at those that I regularly use with good results. In regards to situation “x”, what is the outcome if I make decision “y”? These are all made up situations, but you get the idea. Your own question may be about something very mundane, or completely metaphysical. Narrowing your question down to one aspect of a complex situation makes it a little simpler to analyze and interpret the answers the runes give you. Can you give me clarity on this situation? This is for when you are struggling to get your thoughts or emotions in order. Stressful or complicated situations may leave you feeling confused or unclear, but the chances are that the answers are buried deep within your subconscious. The runes are a magical way to unlock those hidden answers. Asking this type of question and doing at least a three rune spread allows you to parse out your own musings on your situation and become a bit more logical or move forward with confidence. This is a more risky question, as it’s more direct than the pleas for clarity. This is out and out “tell me what to do” which is fine as long as you are prepared for either some blunt or potentially confusing answers. The runes do seem to swing between “Do this right now” and “Sort it out yourself” so don’t be surprised if you don’t get the answer you were hoping for. But divination is sometimes about hard truths, not false hope. The reason this is a good question is because there’s no room for misinterpretation. Visualize your current situation, focus on where you are right now and ask what you should do next. These are just a very few of the questions you can ask the runes. I’ve used all these with interesting and informative results! What questions do you ask your runes? Let us know in the comments or tweet me @Mabherick. Image credit: Stentoftastenen, today exhibited in Sankt Nicolai church, Sölvesborg by Henrik Sendelbach 2005 via Wikimedia Commons. Before I expand further into learning the individual meanings of the runes, I wanted to understand a bit more about the different layouts used in rune divination. Like tarot, there are various ways of displaying runes, and each layout can have different meanings and is useful in different types of situations. We’ve already had a look at a three rune spread, showing what has happened, what is happening right now and what is going to happen; past, present and future. More metaphysically, this can be seen as our current situation, our desired situation and the eventual actual outcome of the situation. We’ve also looked at pulling a single rune, and using that to give us some guidance on a single question. But how else can the runes be used for divination? Pull four runes and lay them at north, south, east and west. The Rune Site tells us that each of the positions of the runes can be named for each of the dwarves that hold up the sky; Nordri, Austri, Sudri and Vestri. This cast expands upon the three rune cast by adding in an extra rune which tells us of what obstacles may be in our way. Nordri: North, the past. What happened to lead the subject to ask the question they are asking today? What led to this situation? Why are we here, in this position, today? Vestri: West, the present. What’s happening right now? How are people feeling? How are they dealing with the current situation? How are subjects reacting to one another? Austri: East, future obstacles: What stands in our way? What opportunities are there? What challenges, and what chance to overcome these? Sudri: South, future outcome. What may we expect at the end of this situation? How will it be resolved? Indeed, will it be resolved, or will it lead to another situation beyond this one? You or your client pulls five runes and spreads them in a line, and they are read left to right. Blackwitchcoven.com tells us that these runes, one to five, are the present, the obstacle, a desired goal, a concern and the final result. Rune One: This is the truth of the current situation and should directly relate to the question the caster or client has asked. Rune Two: This rune will describe or foretell an obstacle which will occur in the caster’s journey. Rune Three: This rune should relate to the caster’s goal, but may reflect an unconscious desire. Rune Four: This rune deals with any worries, concerns or even anxieties about the situation in question. It may be that the caster didn’t appear to have any worries, and was simply looking to the runes for reassurance. This rune will deal with any subconscious worries that are lurking behind the scenes. Rune Five: This rune gives some guidance on what the actual outcome may be. This one seems more complex, but is incredibly useful for obtaining more detail and specifics about your situation or problem. Sunnyway.com tells us this spread can often tell us how we ended up in this position in the first place, and can look three months in to the past, or the future. Another left to right reading, simply choose seven runes, lay six out left to right with the final rune by itself, below the first six. The main difference in this layout is that two runes are read at a time, the meanings combining to give a more complex, but more thorough explanation of each aspect of your situation. Runes One and Two: These should give details on the current problem; what is happening right now; people’s current feelings, reactions and actions; how we are dealing with this situation right now and how it is affecting us. Runes Three and Four: what happened in the past to lead to this situation? What are the root causes? Runes Five and Six: These are the two key runes that will provide the necessary guidance for this situation. Try and interpret the meanings of each rune and see how they relate to one another, in order to get the best advice possible. 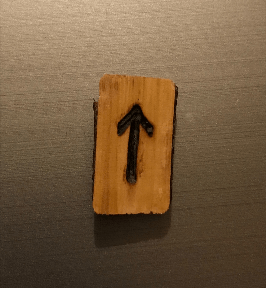 You may be told to move on, to let something go, to hang on to something, to wait, to act; it’s important to try and glean as much meaning as possible from these two runes. Rune Seven: The overall outcome. The meaning of this rune will be affected by the runes that came before, so if it’s a rune where the meaning could be either generally negative or positive, look to the prior runes and see how positive or negative they are, and their meanings; do they back up a negative outcome? Or would that make little sense in the context of this reading? This sounds like a really complex reading, and I doubt I’m ready for it yet, but it’s really interesting to see how the runes can be used together, and not just as individual messengers. In Germanic regions, it was believed that mankind was created from tree trunks, echoing the perception that people and trees have much in common. In Sweden, some trees were considered ‘wardens’ and could guard a home from bad luck. The warden was usually a very old tree growing on the lot near the home. The family living there had such great respect for the tree that they would often adopt a surname related to the name of the tree. A well-known sacred tree in Norse mythology was Yggdrasil, a giant ash tree that was said to link and shelter the nine worlds that were believed to exist. Earlier this year I wrote a blog titled Novena for Fallen Trees. This blog follows on from that article. My (Swedish) surname is Almqvist: it means branch of an Elm tree. My maiden name is Berendsen : it means son or child of a bear. A few days ago I walked up the forest track right next to our house. I was looking for large smooth rocks that might volunteer themselves as spiritual boundary markers for our property (I am collecting 24 of them and painting the 24 runes of the Elder Futhark on them). As I saw one particularly suitable rock and started making my way to it I heard a roaring noise and saw a massive machine rolling out of the forest towards me. I took another leap aside but it veered too and continued to come directly at me. I am all alone in the forest in a pretty remote place. What now?! The machine stopped. A set of green metallic steps was lowered and a large man climbed out. We were face to face, the Logger and I. He offered me his hand and said: I am Sten – who are you? (The name Sten means Stone!) I stood there cradling one large rock like a baby and said: “I am Imelda, I am collecting large rocks”. He nodded as if a woman holding a big rock as if it is new born baby was a normal event in his life. He then proceeded to tell me that he had not seen a human being for four days. He had been working 14-hour days logging away, all on his own. He was desperate for some conversation and a human face. This encounter reminded me of coming face to face with a pack of hunters in the same forest, in October last year. This was after waking up to a gunshot outside my window and then finding a dead young deer on the track in front of our house. I set with this deer for a while and spoke some prayers. The forest that surrounds our house is owned by two large local country estates (essentially two aristocratic families). Everyone who owns forest land must file a plan with the forest authorities (a family friend who owns forest land has explained this to us). Sten is just doing his job. He works for the logging company that was hired to turn mature trees into logs. Those logs might then become buildings (or IKEA furniture). There exist many myths throughout the world that say human beings are descended from trees, and these are particularly prevalent among Indo-European cultures. In Völuspá the first humans, Askr and Embla, are created from pieces of wood, and in Gylfaginning Askr and Embla are created from driftwood logs found on land by the sea. The three gods credited with their creation include Odin, and either his brothers Vili and Ve or companions Hœnir and Lóðurr (believed by some to be Loki or, by others, Frey). Each god endowed the first man and woman with different attributes. I had briefly contemplated doing something heroic, like dramatically throwing myself in front of his death-machine. However, Sten doesn’t call the shots, he does not have the power to reverse any decisions. He is only doing his job…. Yesterday evening I decided it was time to check how far the destruction had reached. I brought a candle, red paint and a huge drum with 24 runes painted on it. Things were even worse than I thought. My youngest son has a favourite hang-out in the forest that he calls Lynx Rock. – Lynx Rock is no more – it has been raised to the ground. This week I had a dream where I was painting the rune Eoh (Eihwaz in the Anglo-Saxon system) on the tree stumps of fallen trees. Eoh represents the world tree and world pillar or axis mundi. So I used my red paint to do this. I turned one large tree stump into an altar where I had my candle burning while drummed loudly enough to raise the dead. I half expected the loggers (holed up in their caravan) to come running and investigate what was going on – but they stayed away. I drummed. I chanted. I prayed. I asked the spirit of the world tree for regeneration and healing of this land. I apologised to all the animals, plants and creatures that had just lost their homes. I took a moment to connect to tribal peoples all over the world who have lost their trees and way of life to loggers and deforestation. As the world axis, the World Tree runs vertically through the centre of the cosmos and links the heavens, earth and underworld together. Holding the many worlds within its boughs, it is the connecting point between all realms. Its branches (or, in some cases of inverted world trees, the roots) stretch into the realm of the gods while its roots reach into the depths of the world of the dead. It also functions as an anchoring point – a sort of “world nail” or “spike” (Old Norse veraldar nagli) – around which the firmaments revolve. It is sometimes represented by the Pole Star, or North Star, since the skies do appear to revolve around this central, fixed point. As Åke Hultkrantz mentions in a discussion about world trees and pillars in shamanic cultures, the world tree and world pillar/nail were probably two distinct concepts initially which eventually merged together. When all that was done, I made my way home down the forest track. The daylight was going. I was still extremely upset but I felt better for having performed my vigil and “rune activism”. In Old Europe there were many ancestor cults involving trees. It was believed that after death the souls of the ancestors took up residence in trees. This is why many forests and groves were so sacred and there were severe penalties and punishments for messing with trees. What if the Old Europeans were right? What if Heaven does not exist or Heaven turns out to be a forest in this world where our souls take up residence in trees after death so we can continue to watch over the living (and pray that they pay attention to our loving guidance)?! Do we give this ancient belief any thought before we decide to decimate forest land?!! Imelda Almqvist is an international teacher of Northern Tradition shamanism and sacred art. Her book Natural Born Shamans – A Spiritual Toolkit for Life: Using Shamanism Creatively with Young People of All Ages (Using shamanism creatively with young people of all ages) was published by Moon in 2016. She is a presenter on the Shamanism Global Summit 2017 as well as on Year of Ceremony with Sounds True. She divides her time between the UK, Sweden and the US. Her second book Sacred : A Hollow Bone for Spirit (Where Meets Shamanism) will be published in March 2019. She is currently working on her third book: Medicine of the Imagination. Depression is a disease that affects millions of people, regardless of religion, ethnic background, genetic make-up or economic outlook. Many of us take antidepressants, trying to feel better and suffer dubious side-effects from these medications. Some of us become addicted to these meds. Others of us self-medicate with drugs and alcohol and may end up with addictions to these substances. Some of us console ourselves with “comfort” foods, while others of us lose our appetites altogether and even when we are ravenously hungry, we can not eat. Some of us relieve our psychic pain by cutting ourselves. We lose pleasure in many of our favorite activities. Our days are long and boring. Depression robs us of all that once made us happy. I personally suffer from bipolar mood disorder, which means along with depression, I also have episodes of mania. I am actually what’s called a “rapid cycler” – I can cycle in and out of manic and depressed moods within a single day. I can be depressed and manic at the very same time. But like a day is contained within a week and a week is contained within a month, my days of rapid cycling are contained within seasons of either manic moods or depressed moods. Generally, I am more manic in the early winter and later spring and depressed in the early spring and most of the summer. Since being formally diagnosed in 1993, I have been on dozens of medications, most of which have been totally useless. I fully believe that most of the medications caused more problems than they solved and most of the problems that I had in the 1990’s and early 2000’s were a direct result of taking psych meds. I was out of my mind most of the time. I have been fairly stable since I reached my Crone years but I still have my moods. This recent depression was triggered way back in 2016 when our current president was elected and I think many of us went into a deep slump at that time. Certain health issues of mine came to fore, as well as housing problems, and I had to move from New England – which I love – back to Buffalo – which I do love, but Buffalo is like loving an abusive man with addiction issues who’s never going to change. I know that many cities are just like Buffalo but I don’t have the emotional attachment to those other cities. And things really are worse here than they were in 2016 – for poor people, that is. There’s lots of shiny new buildings and expensive restaurants and microbreweries selling drinks that will give me a migraine after the first sip, they’re so damn hoppy. But that’s another subject. At this point, I have been depressed for well over a year – with seasonal episodes of mania, like the one I’m in now – and it is affecting every facet of my life. If being depressed is defined as “losing interest in things that used to interest you”, then I have got the sickness pretty bad. I love to cook and eat but I have lost interest in food altogether – I go for days, eating nothing other than Cheerios, fried eggs and peanut butter and jelly sandwiches. I simply do not care. I stopped writing my novel over a year ago – I even took the blog off WordPress – I keep saying that I’m going to restart it – and honestly, I miss my characters – they were like friends of mine! But I don’t write – I barely keep my diary. One of the things that depression has stolen from me is my desire to use my Tarot cards or throw the I-Ching or study the Lenormand or pull a few Runes or anything. Like my attitude toward food, I simply do not care. It’s like – so what? One day is just another day. And with the madman in the White House, we may not have a tomorrow anyway. So what difference does anything make? I was cleaning the other day – this is where being manic always works out – and I found my divination journal. The paucity of entries are pathetic. The last time I had done a reading was in February! And honestly, I didn’t remember it. I did a Tarot reading that day – a Celtic Cross – with my Rider-Waite cards – partly because I felt guilty that I hadn’t done any readings in such a long time and partly because I thought that maybe I would see something new. Maybe it was my depression – but it just seemed to me that the cards were telling me that I was depressed – which I already knew! But maybe it’s just I’m too depressed to be reading my own cards. I don’t know – which brings me back to the whole point of this essay – depressing and divination. What is a practitioner to do? I have to step out of myself to answer this question – as if I were being asked the question by another person. I would answer, go back to the basics. Pick one card a day and meditate on that card. Read all of your spiritual books and remind yourself of your path and why you are on this path. Go to the park and walk where it is green and quiet. Listen to the birds chirping. I was told that there is no cure for bipolar disease and I do not think there is a cure for depression – there is only managing the symptoms. But I am going to do what I *told* myself to do – pick a card a day and meditate on that card. Read all of my spiritual books and remind myself of my path and why I am on this path. Go to one of the many parks in Buffalo – even if it means getting on the bus – and walk around the greenery that I have right here. Everything will change. The wheel will turn. For this stage in my journey with runes, I decided to do a little divination for myself. I’m wanting to begin working from home within the next year, hopefully within a few months. I’m at home with the six-month-old baby at the moment, but will have to return to the ‘day job’ by October, and everything in me rails against it. I want to be at home with my family, and I already write all the time anyway, so why not make a career out of it? Having already made steps in this direction, I was interested to know what the runes would make of this decision. I pulled out a single rune for this particular piece of divination. This rune (pictured) was Ansuz, which literally means ‘God’. It’s normally associated with either Odin or Woden, the runes having come from Norse and Germanic origins. Esoterically, this rune is complex but tends to mean ‘inspiration’, which as a writer, is definitely one of my favourite words. Ansuz is also linked to communication and answers, something I was definitely hoping to get, so how does this rune translate into an answer to my query? Ansuz is the rune of air, specifically breath. It is the breath of the universe, and the first breath that takes the spirit into the body, and the last breath that allows the spirit to escape. It is intrinsically linked to words and the power of words, particularly names. Words develop from and into concepts and creativity, and are often the focus of communication. As a writer wanting to make a career from my words, this rune tells me to listen to my inner voice, to embrace my creativity and use the talents I have to make this step. Ansuz is also a rune of order. It indicates that even when the path is unclear, or times are difficult, that the universe has a plan and that ultimately, order will prevail. Ansuz encourages us to find patterns within chaos, and to trust that all will be as it is supposed to be. To me, this encourages me to take a leap of faith. Even if I have doubts, if I trust in the divine energies of the universe (and work hard! ), I will find myself in a place that is good for me and my family. Ansuz also reminds us to listen. Breath comes from the universe, from Odin, from ourselves but also from others. We must acknowledge that their breath, words and ideas are as potent and important as ours. We should take care with our words and not use them for manipulation or menace. 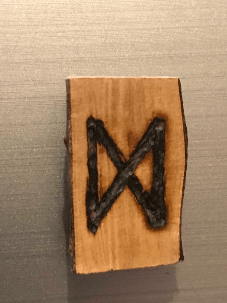 I’m a bit taken aback that for a question about writing and a big change in my life, I’m given a rune that focuses intensely on words, inspiration and creativity. I’m also reminded of the power of my own voice, and that words can do great harm, as well as great good. At the very least, this has inspired me to take the step I was tempted to take anyway, and see where the path takes me. The best interpretation is that this is definitely the right choice for me, and that if I trust the universe and my own inner voice, I will end up on the path that is truly best for me.